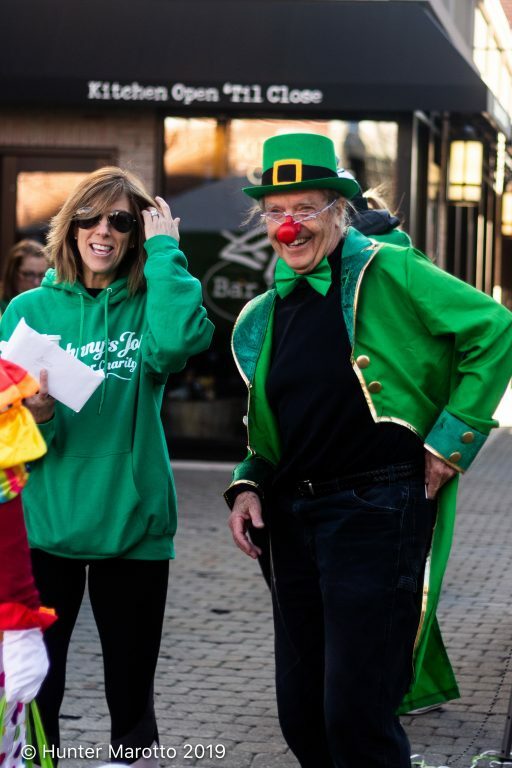 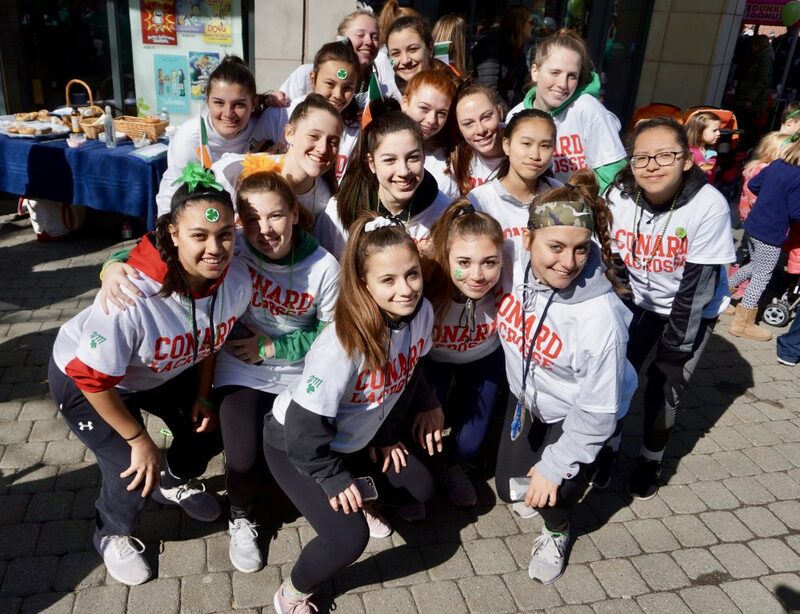 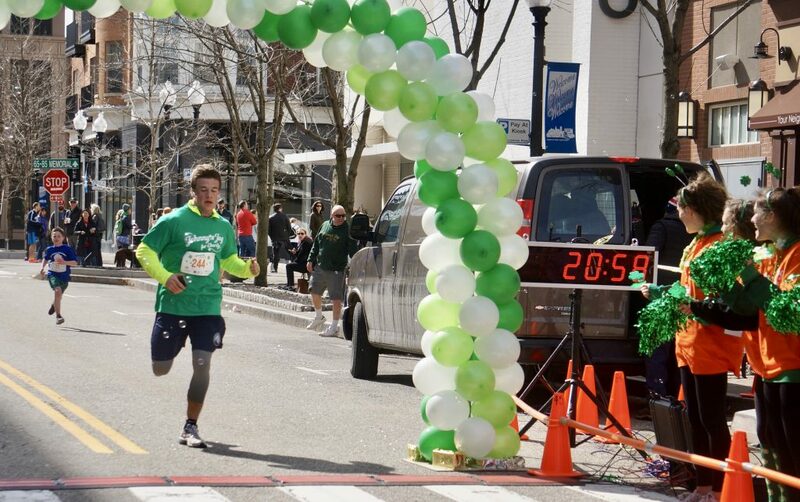 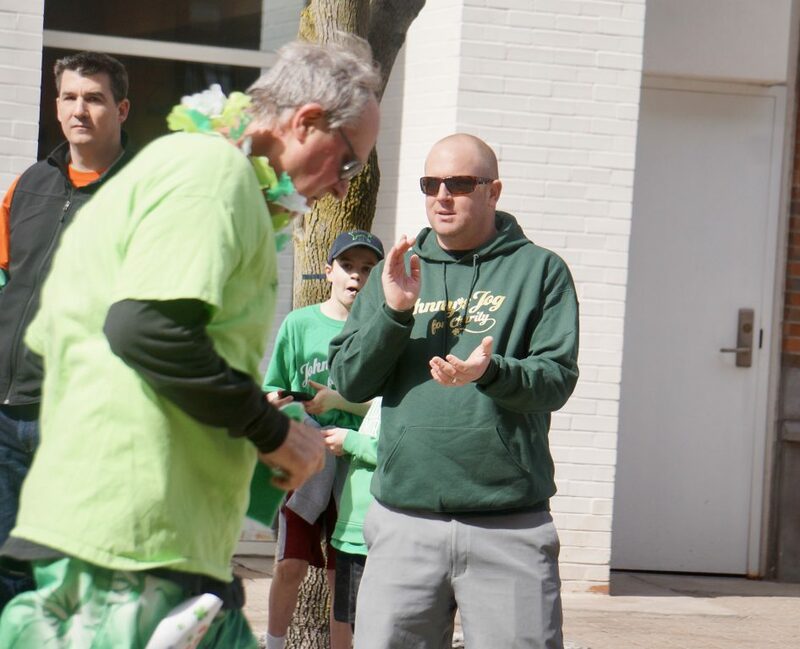 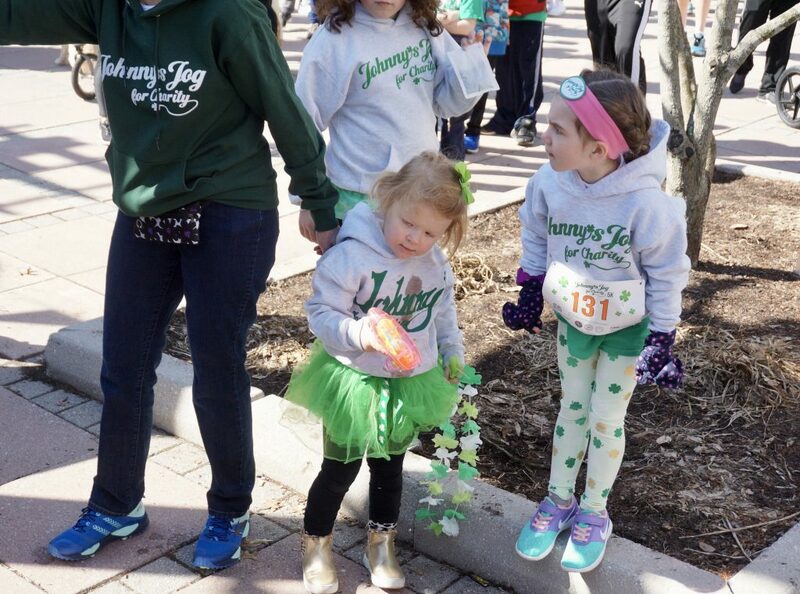 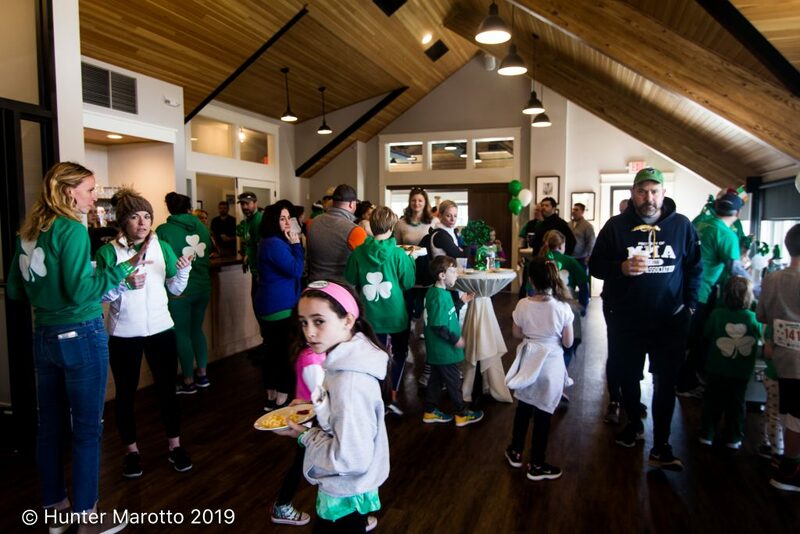 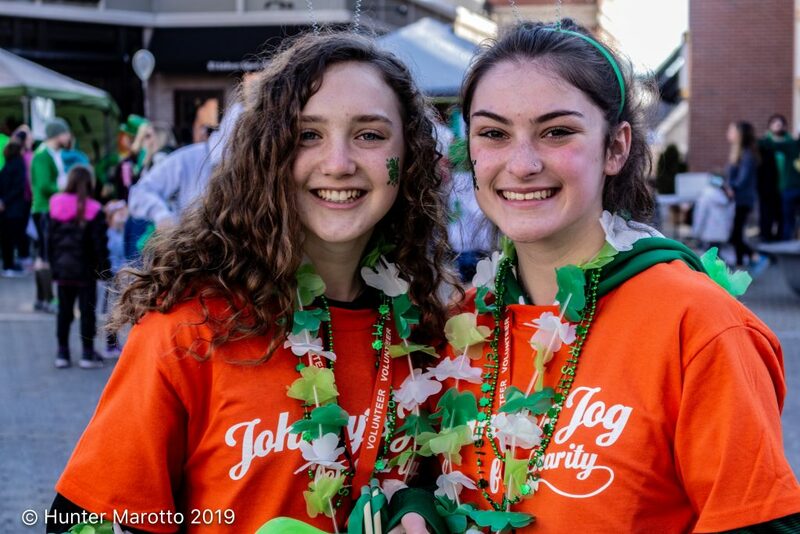 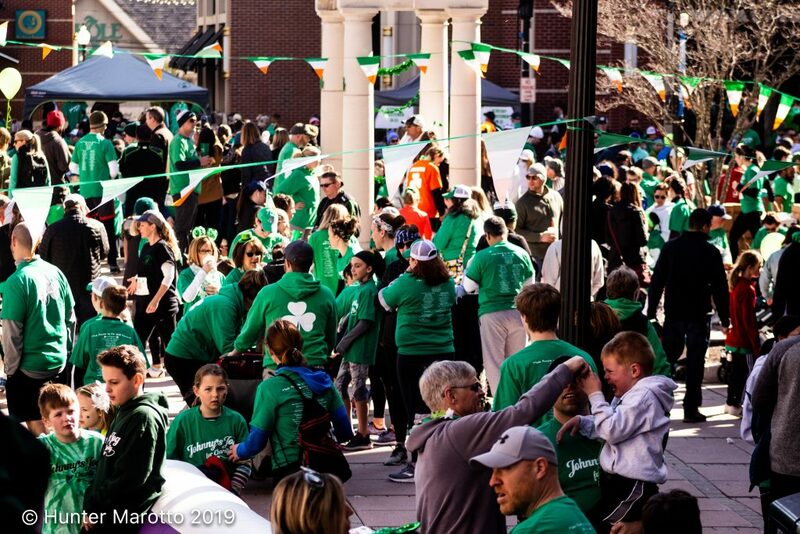 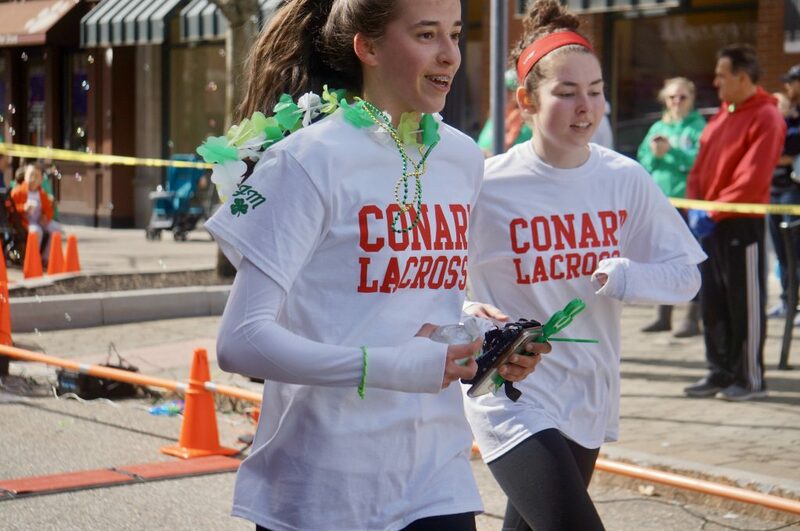 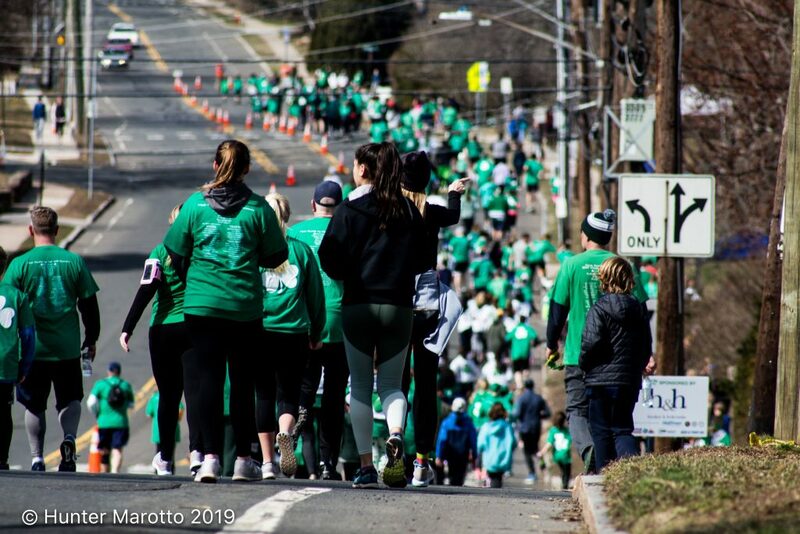 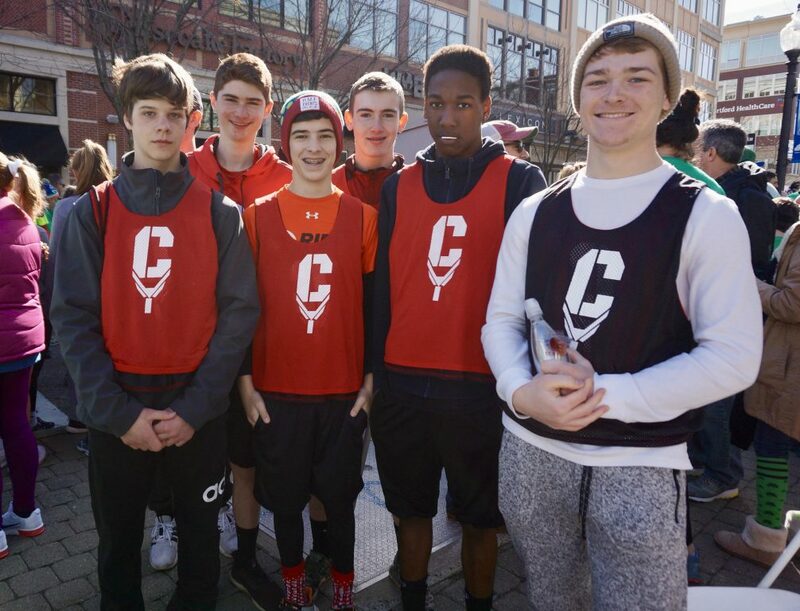 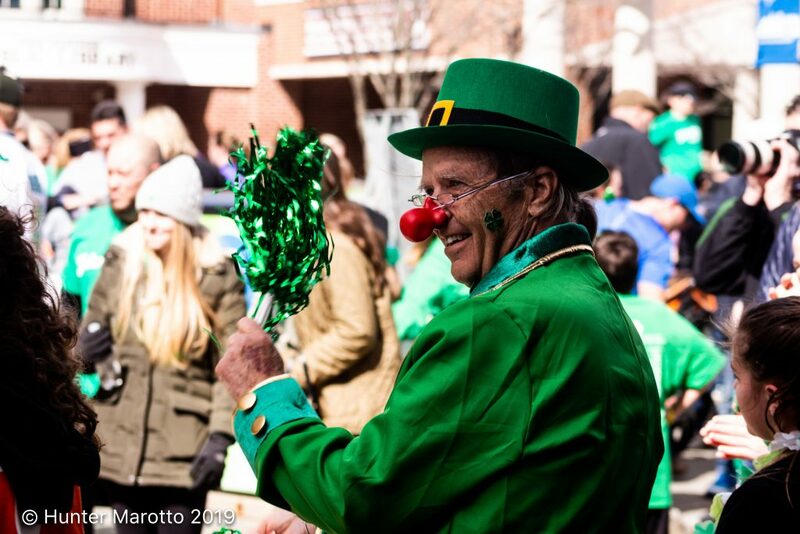 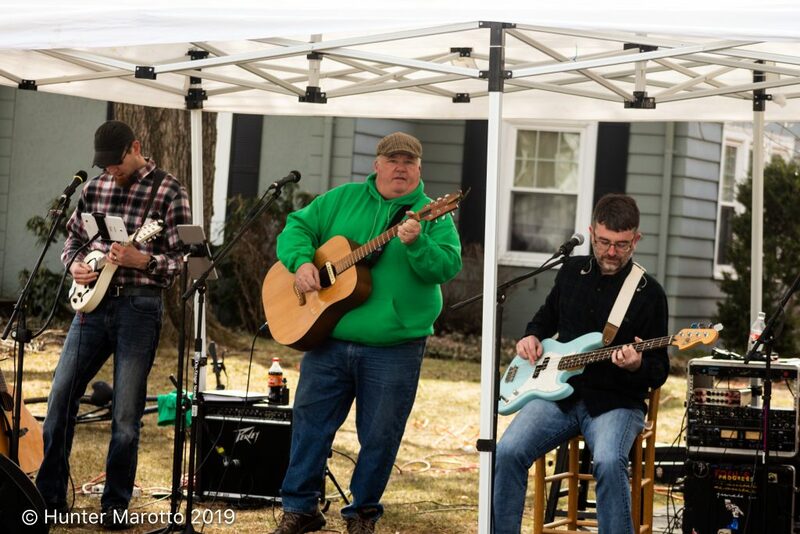 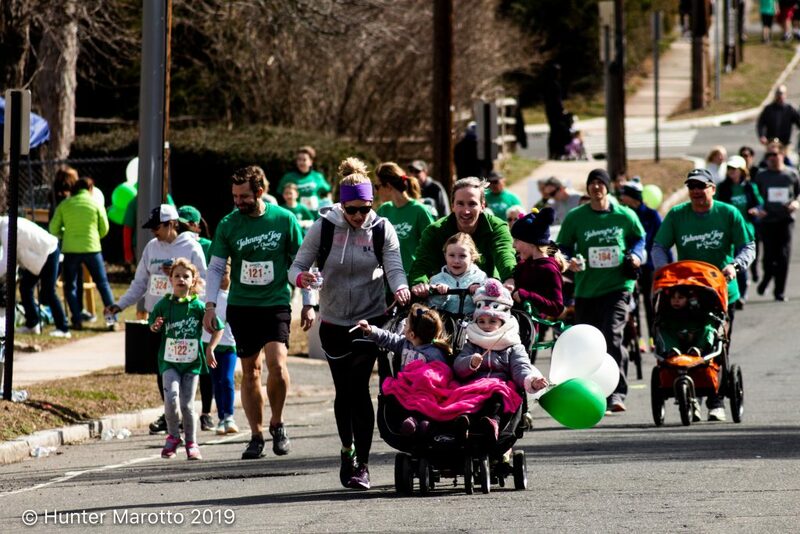 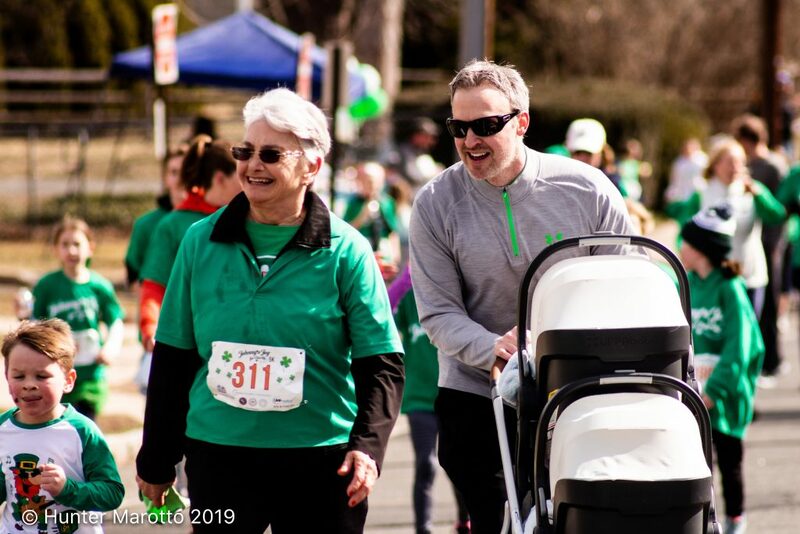 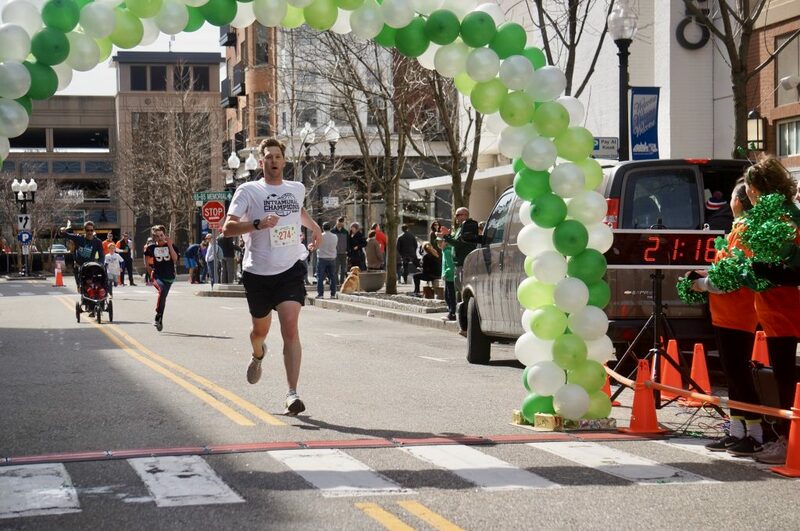 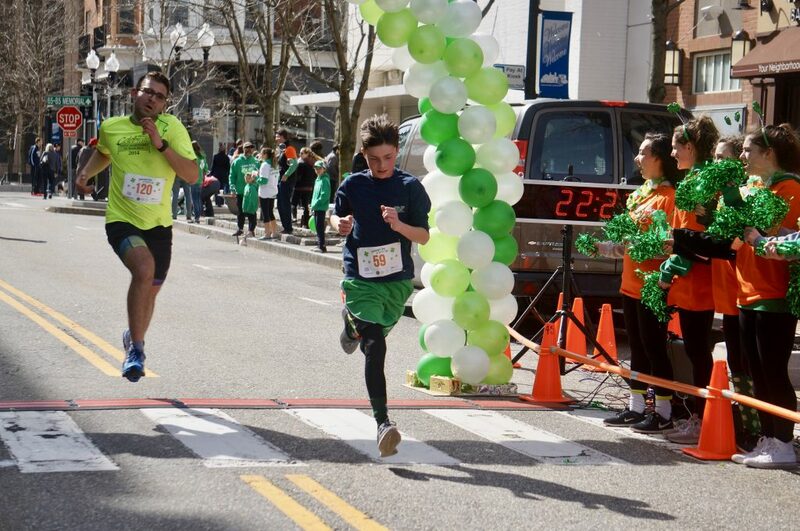 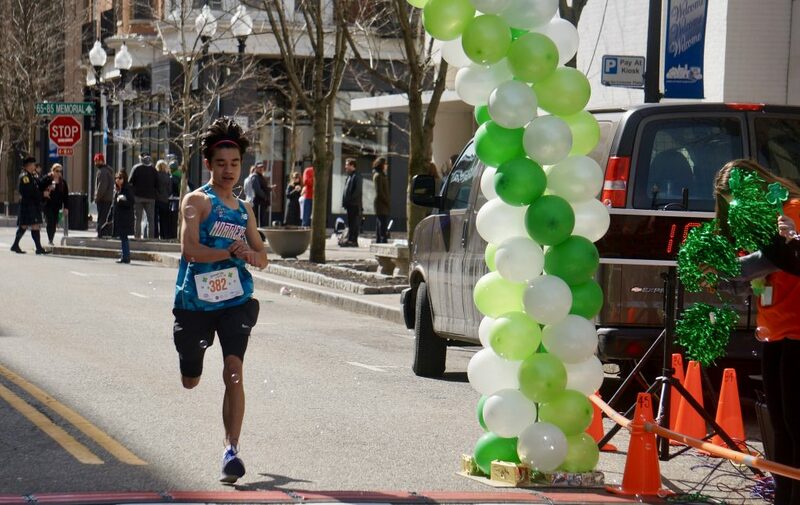 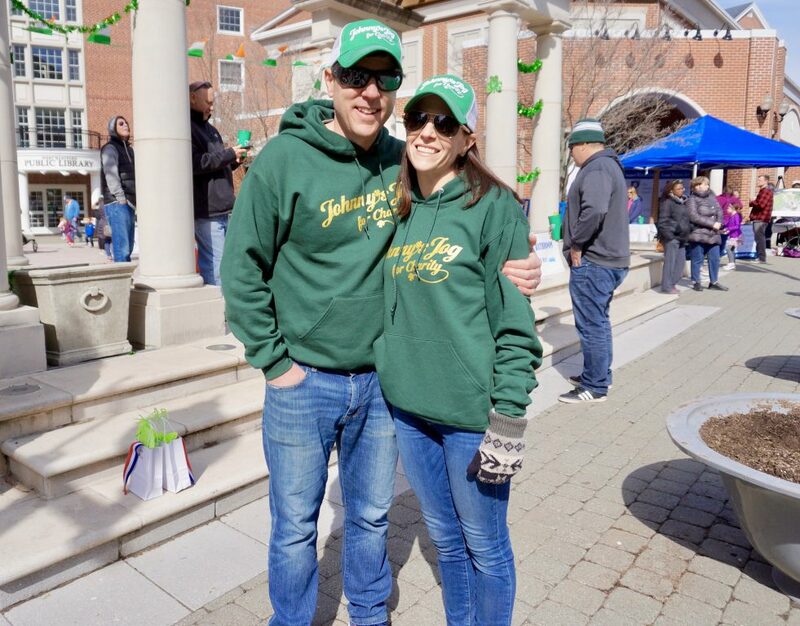 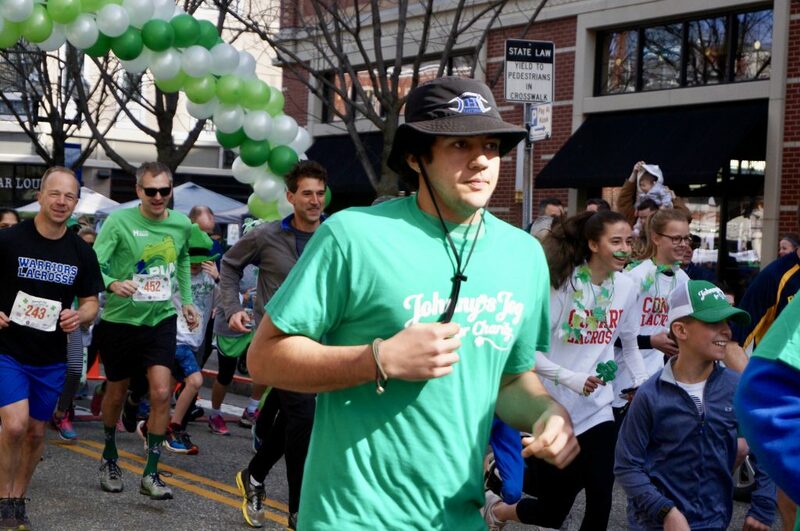 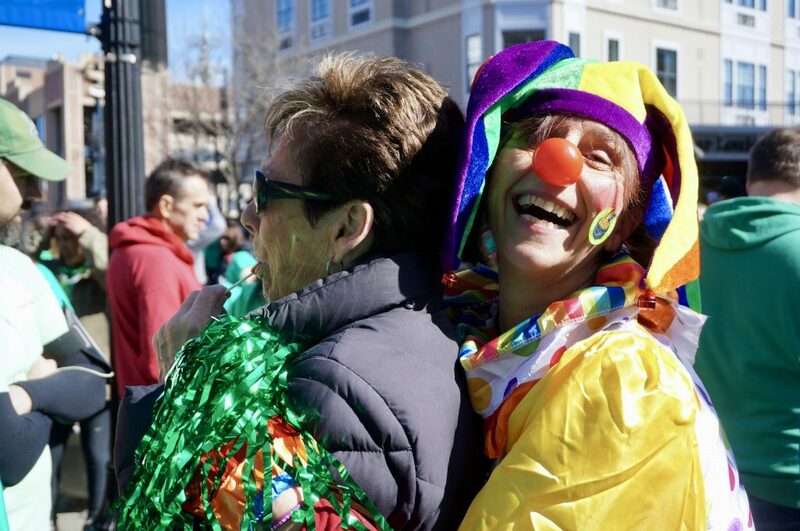 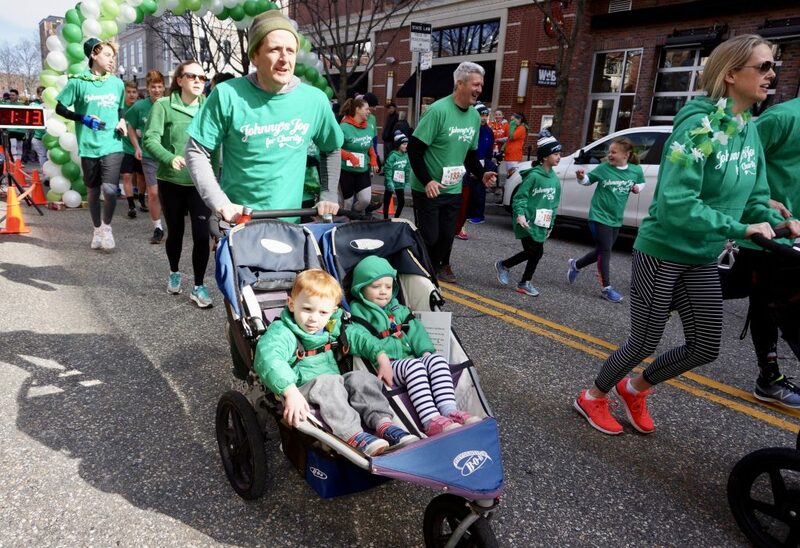 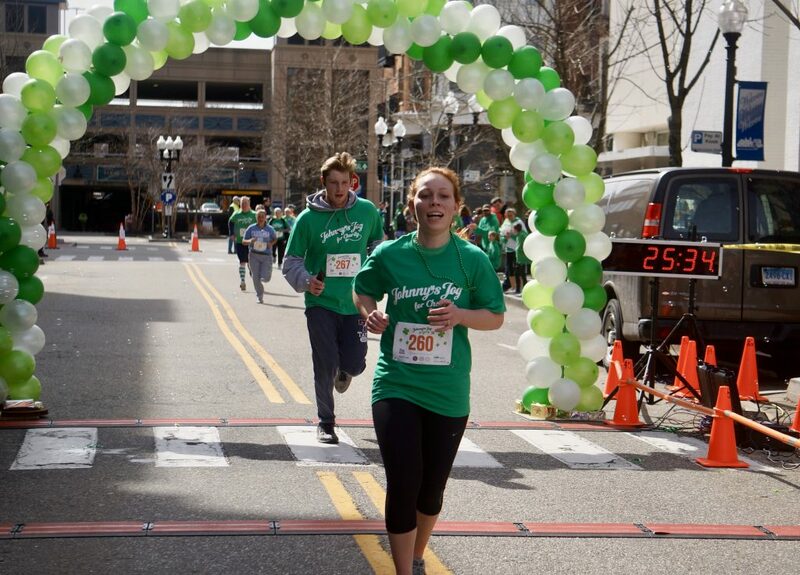 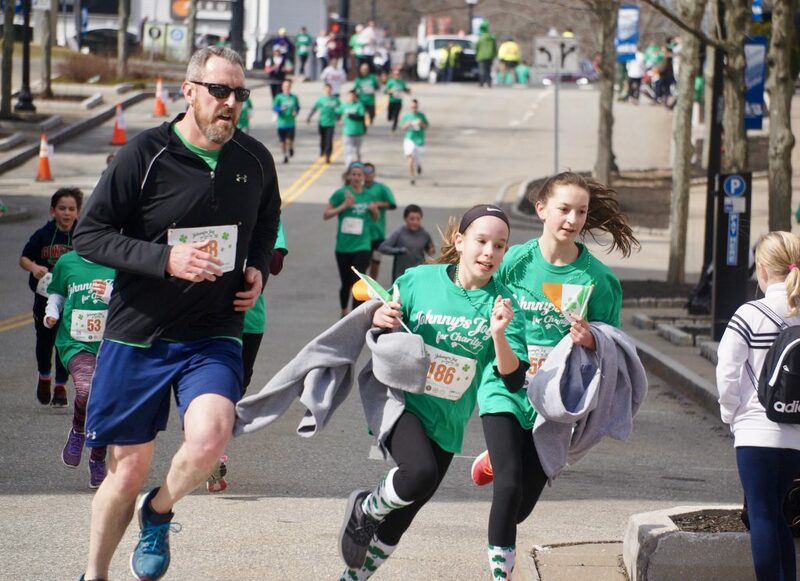 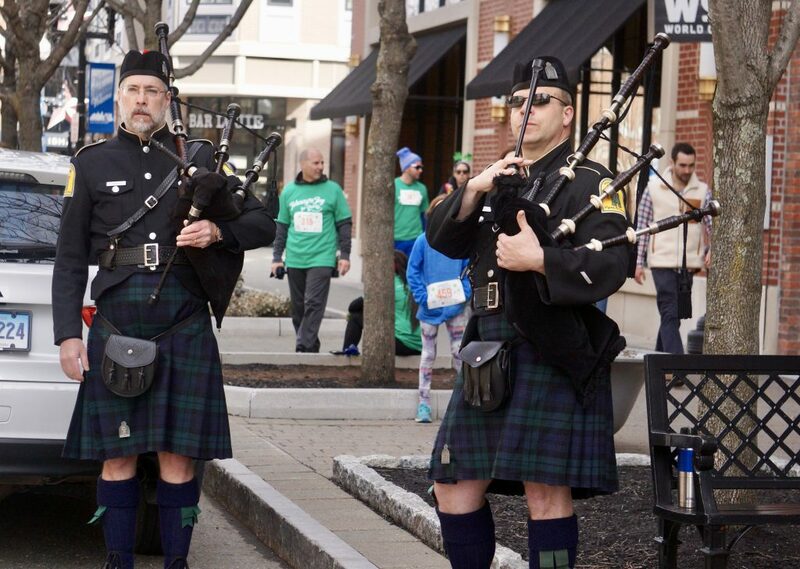 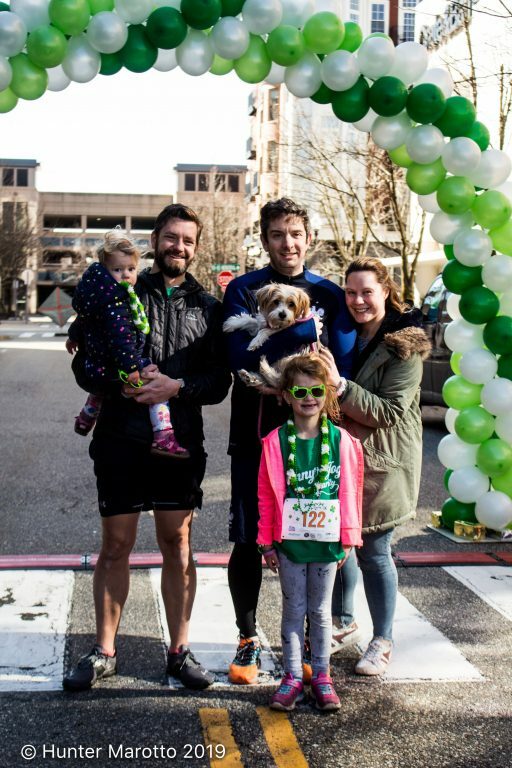 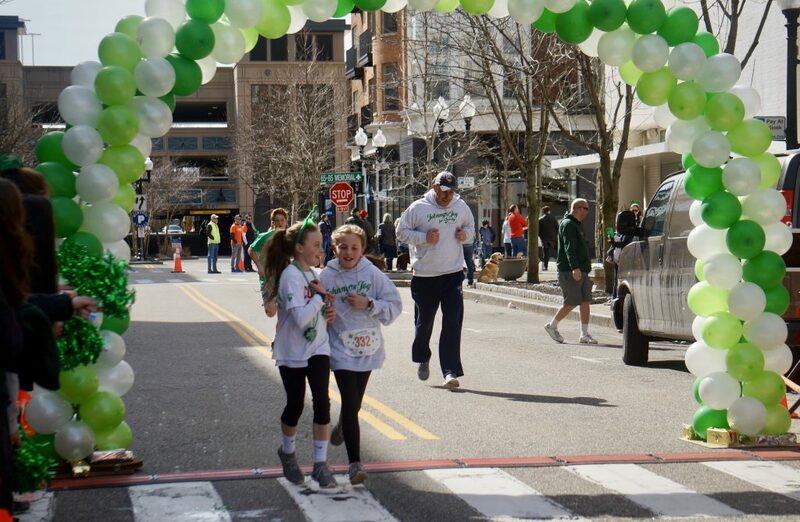 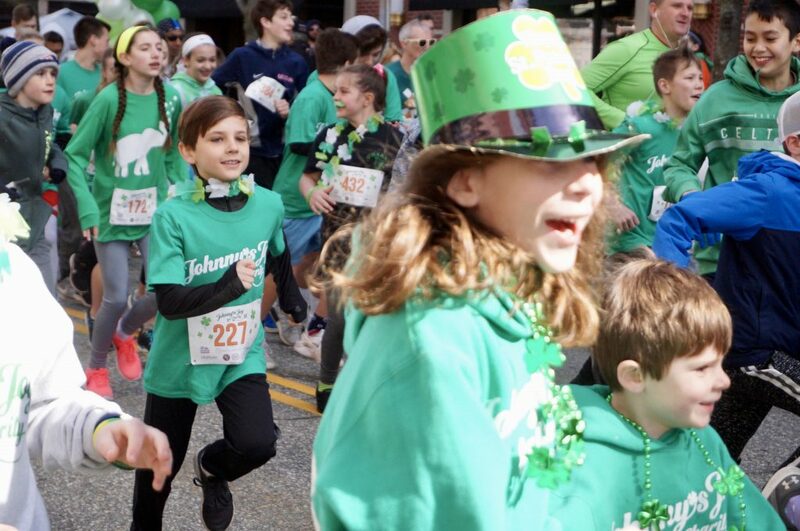 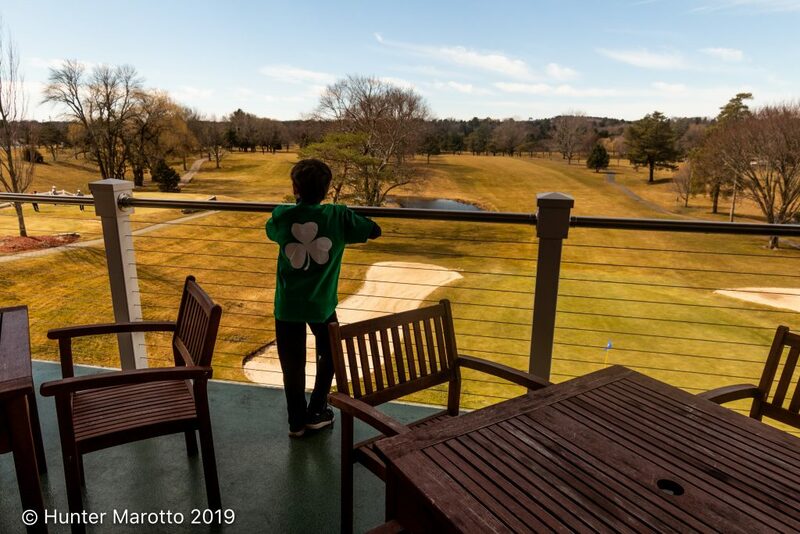 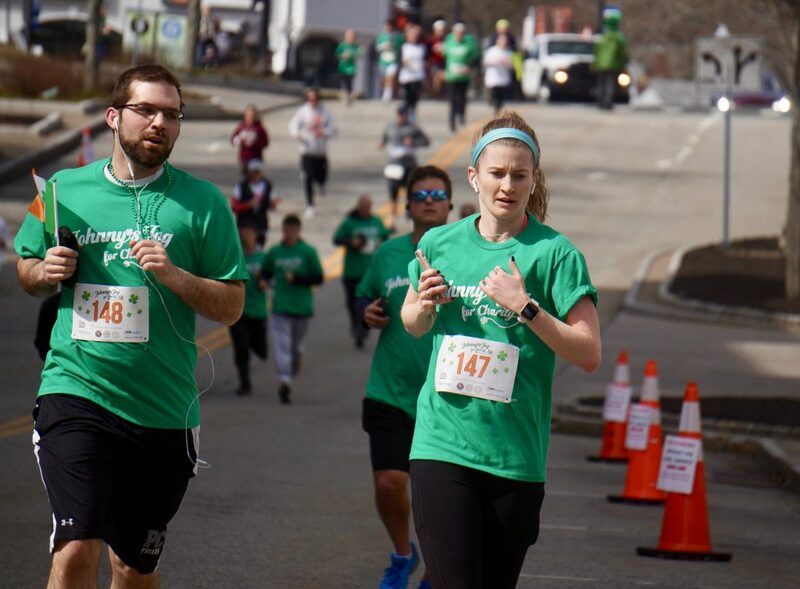 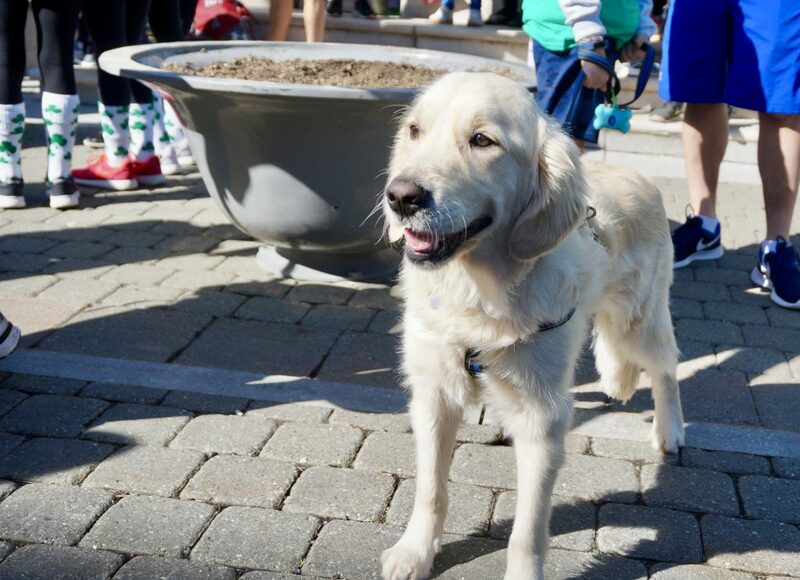 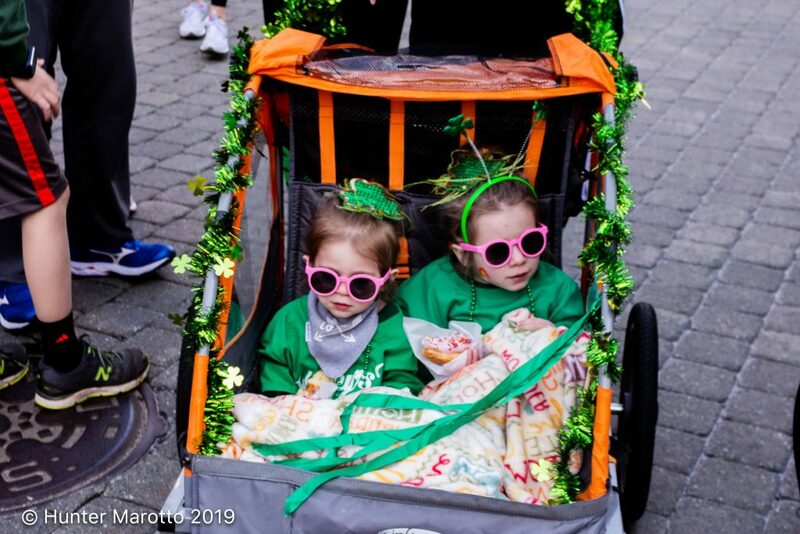 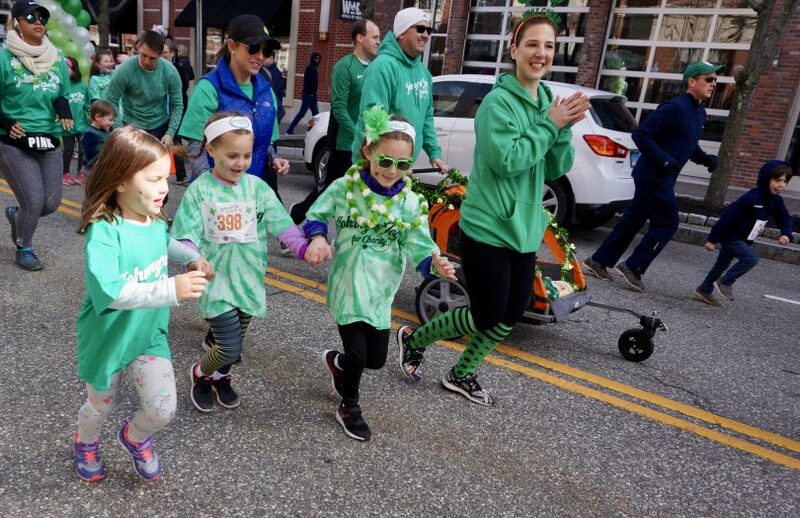 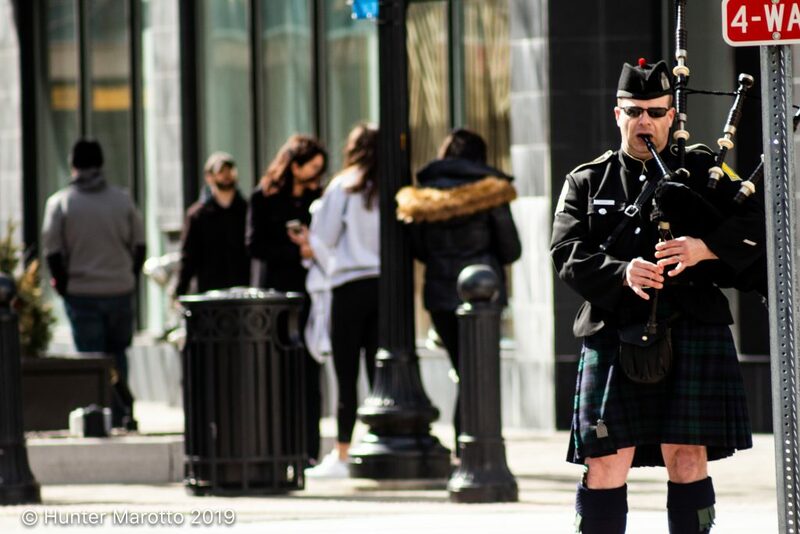 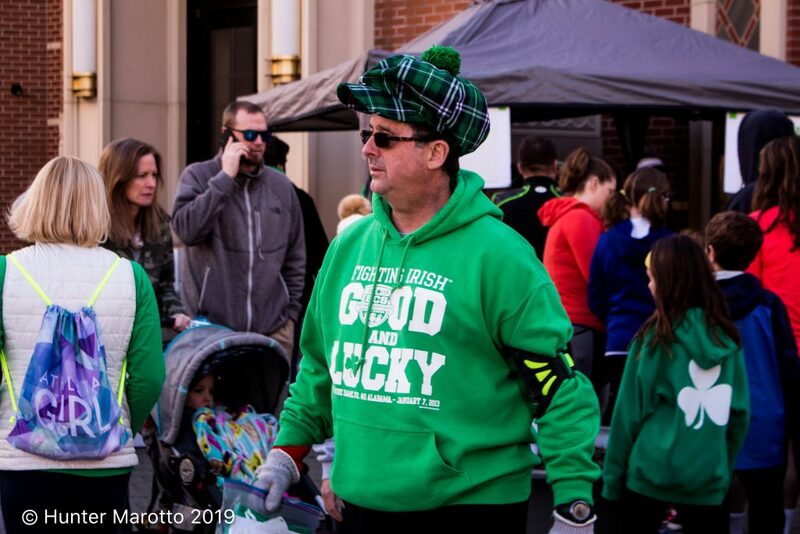 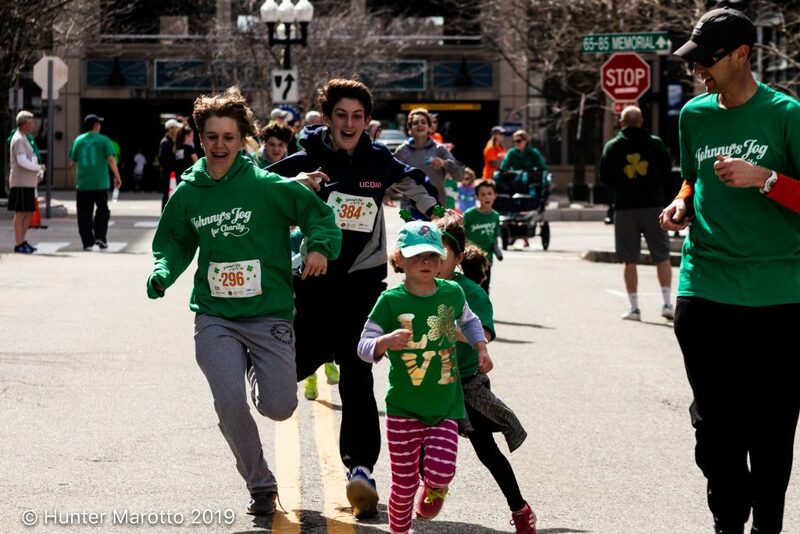 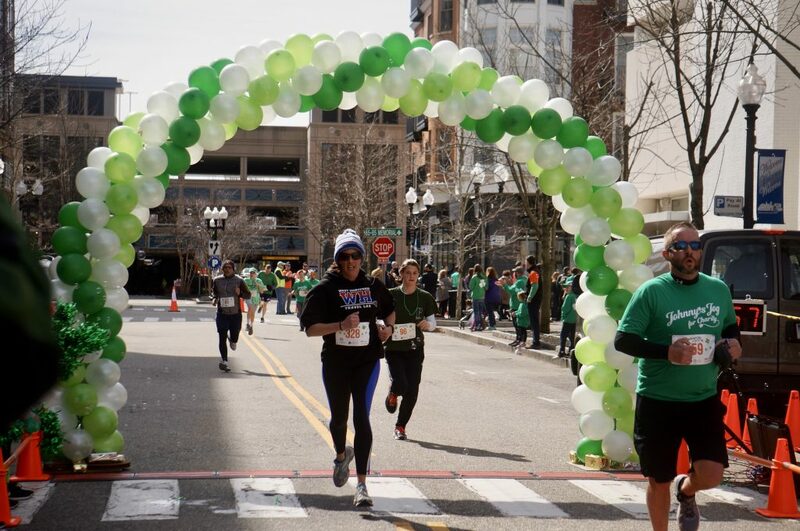 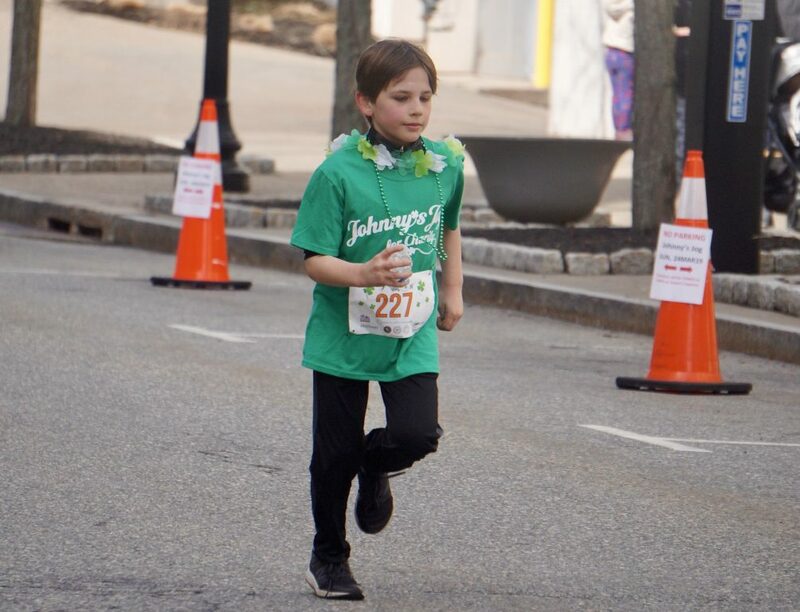 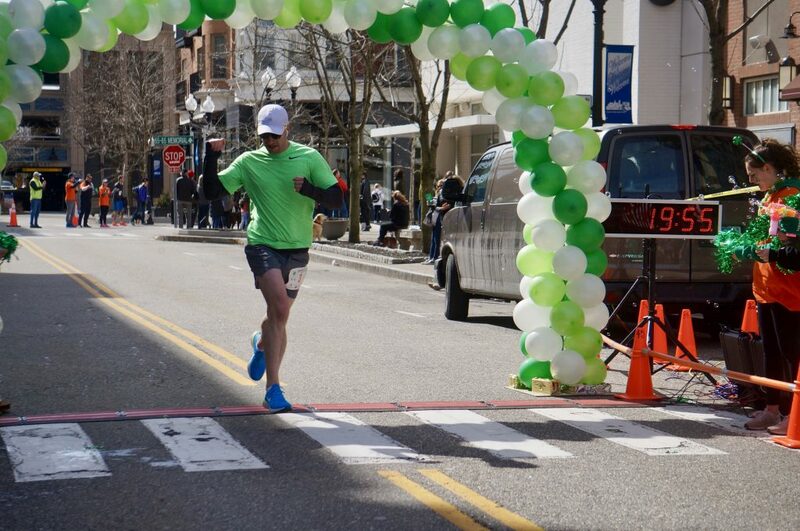 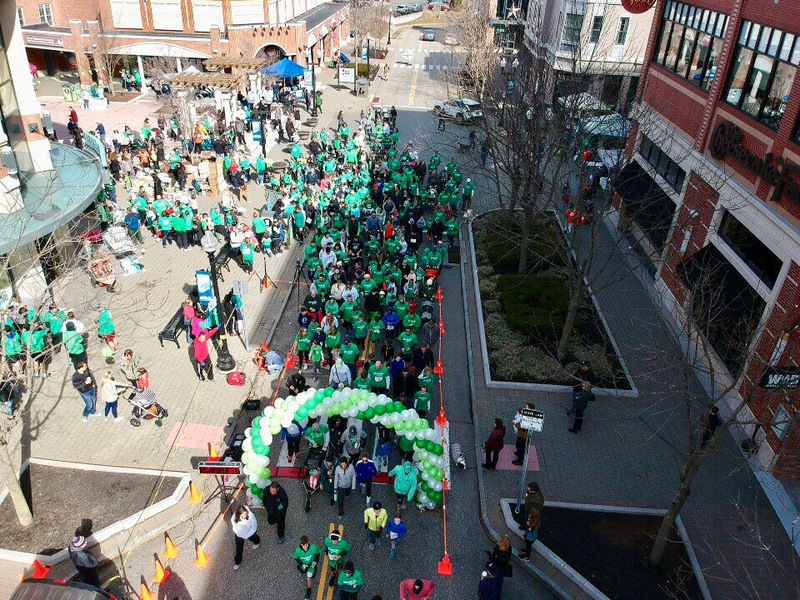 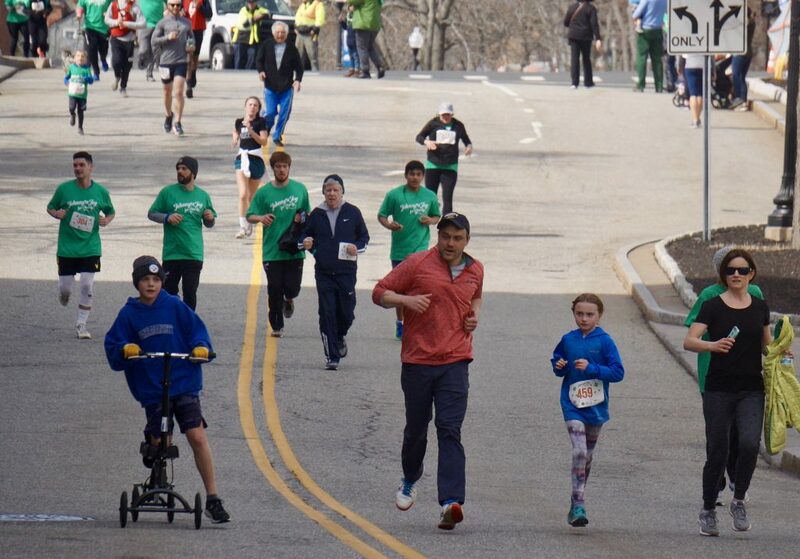 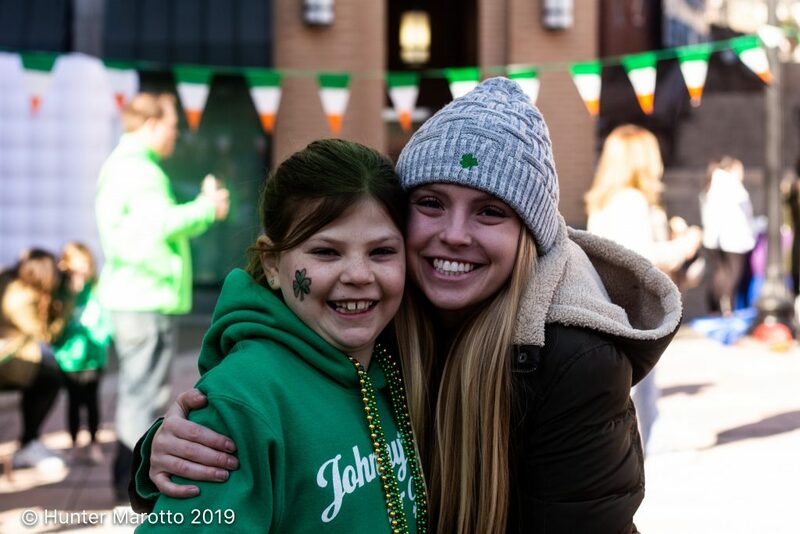 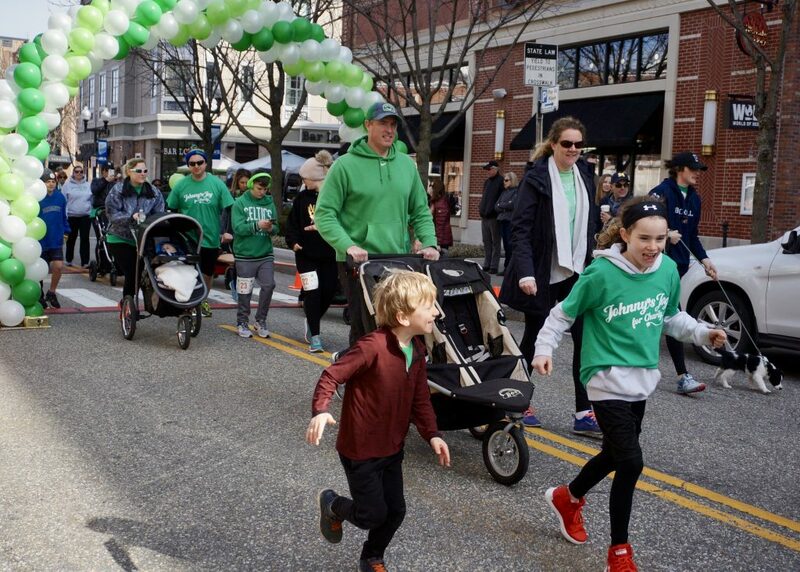 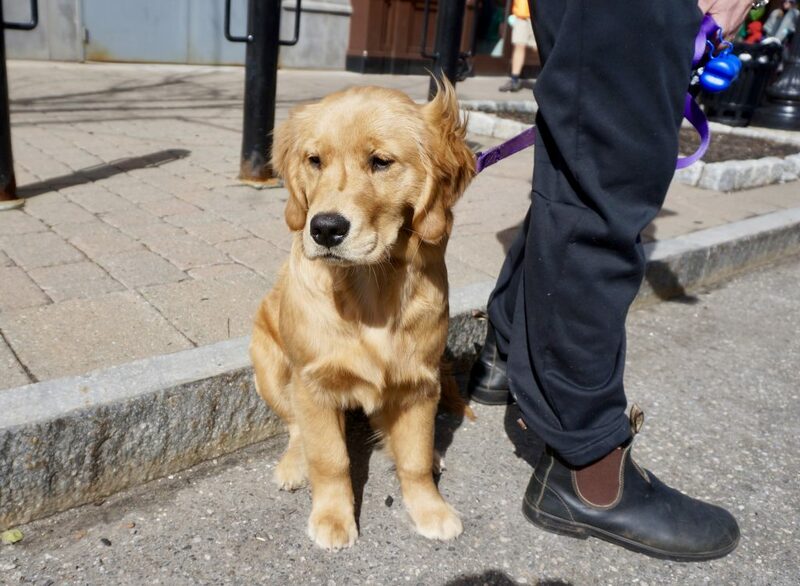 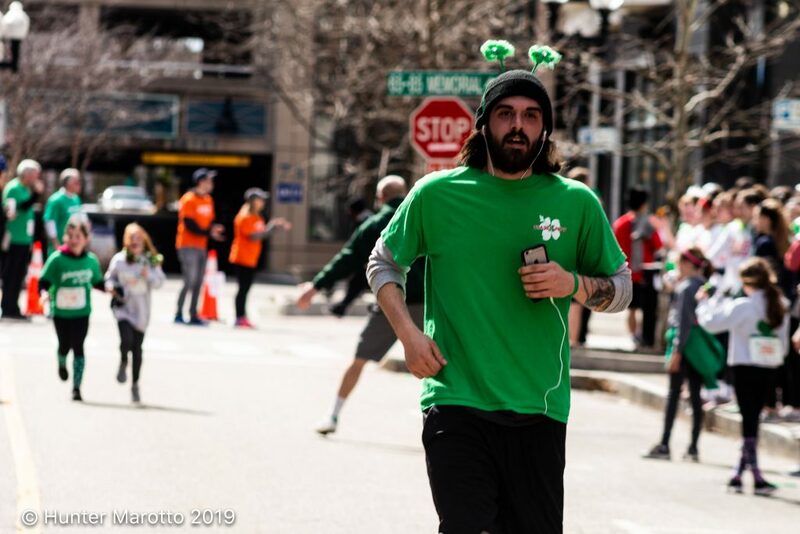 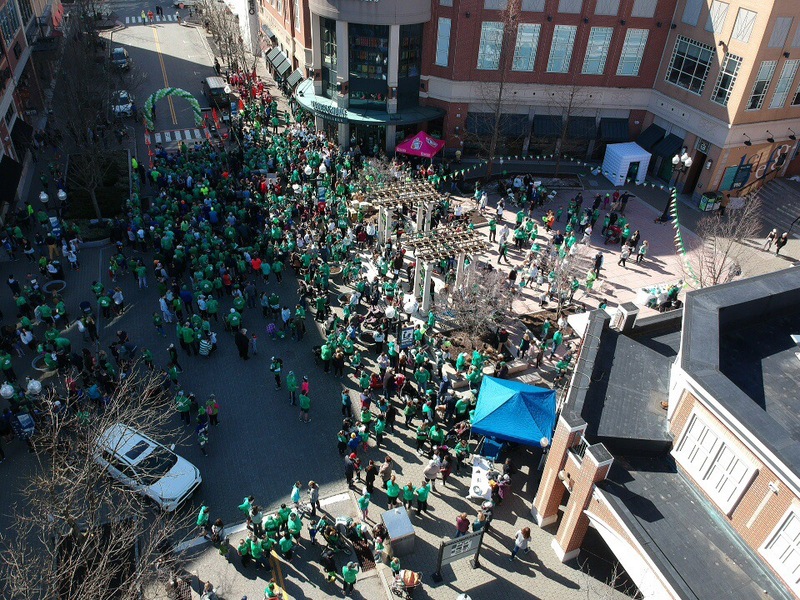 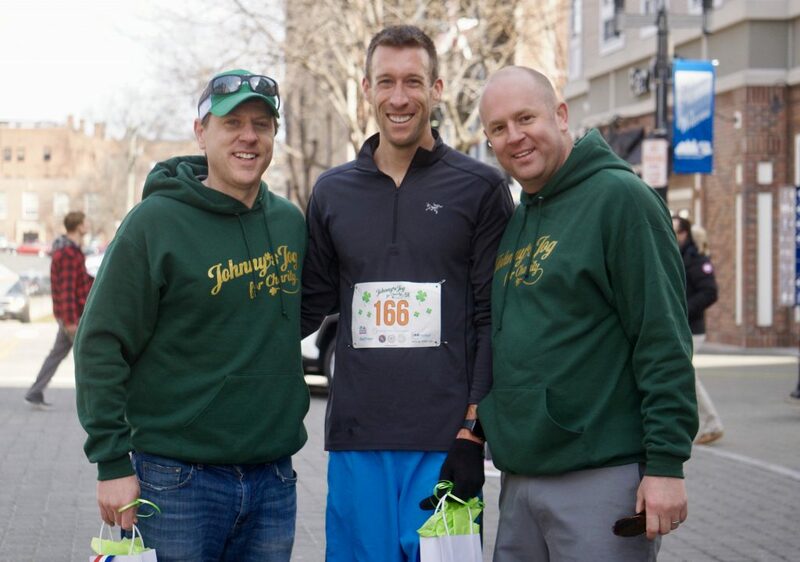 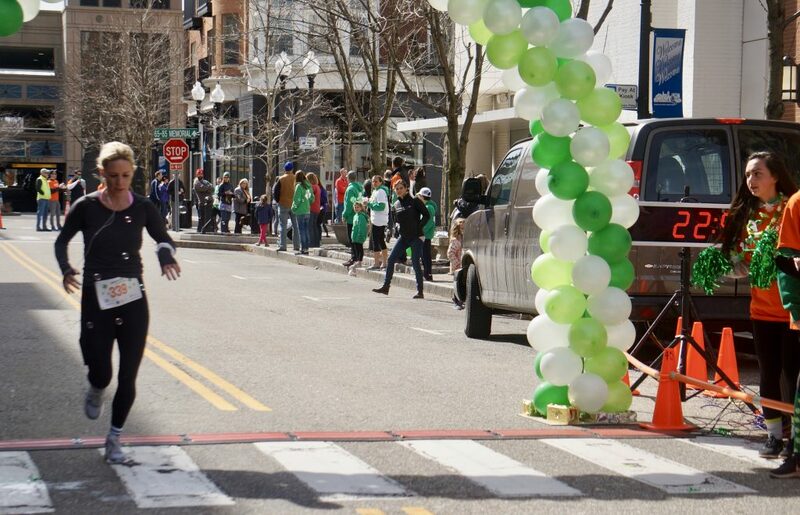 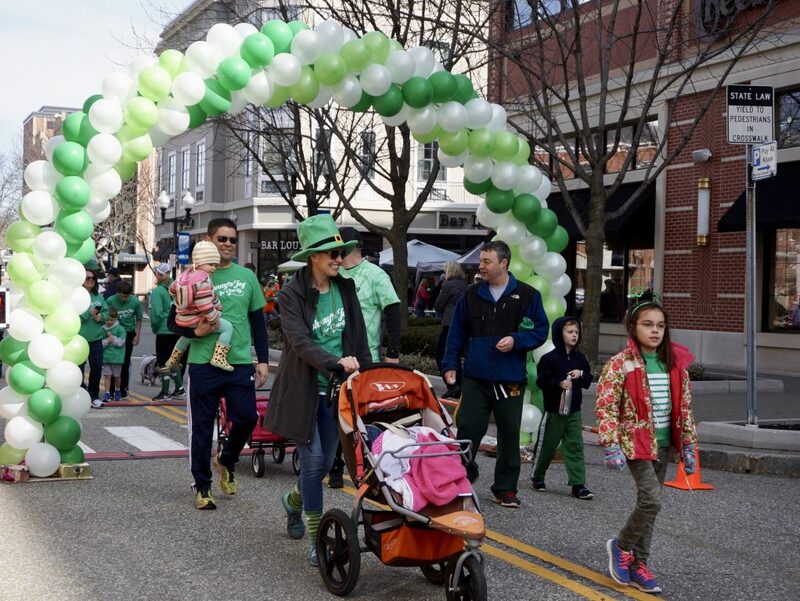 The ninth annual St. Patrick’s Day-themed Johnny’s Jog for Charity 5K was held on on Sunday, March 24, 2019, in West Hartford’s Blue Back Square, and raised an estimated $80,000-$90,000 for local nonprofits. 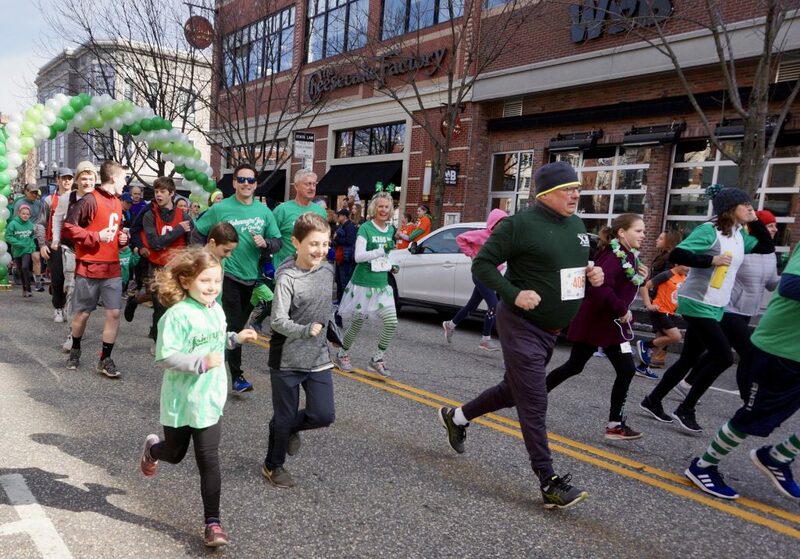 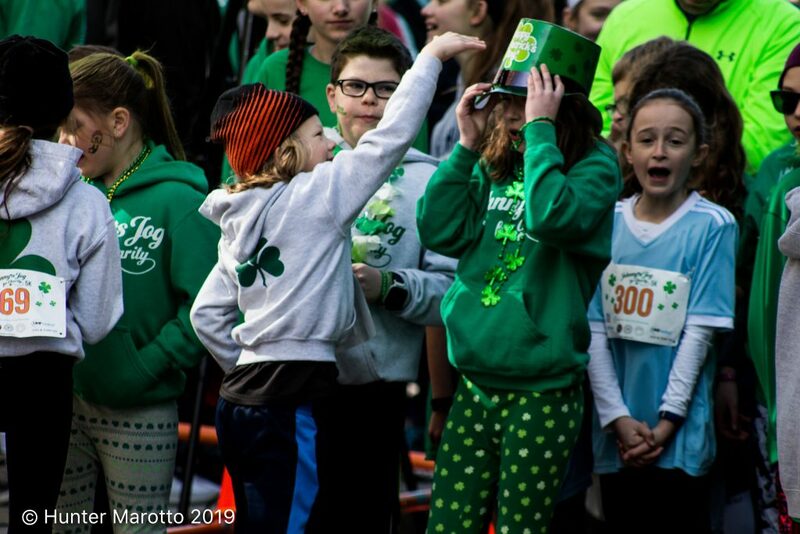 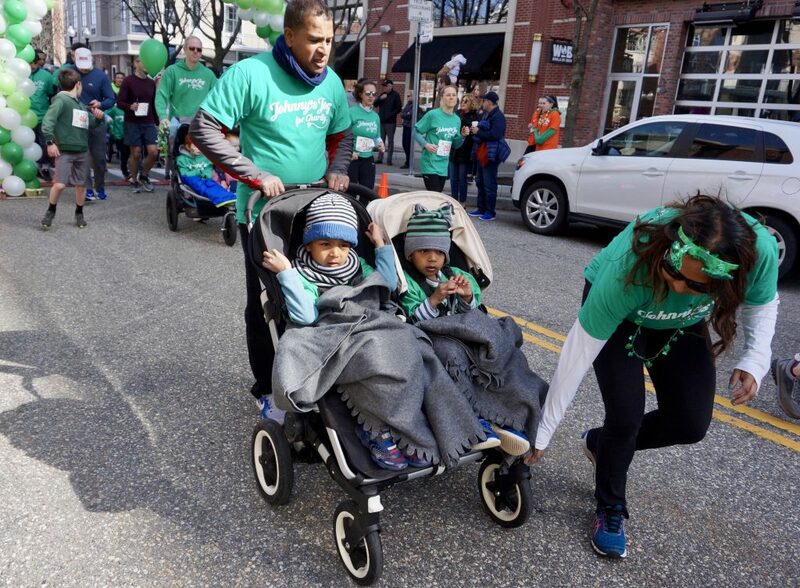 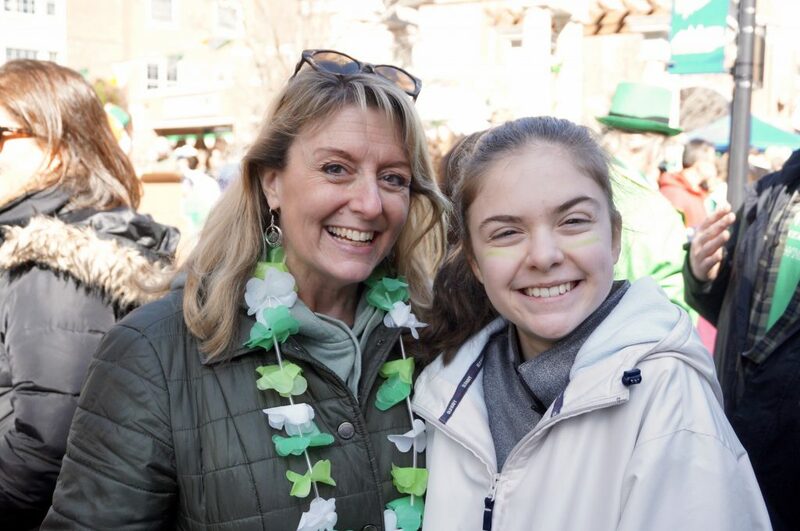 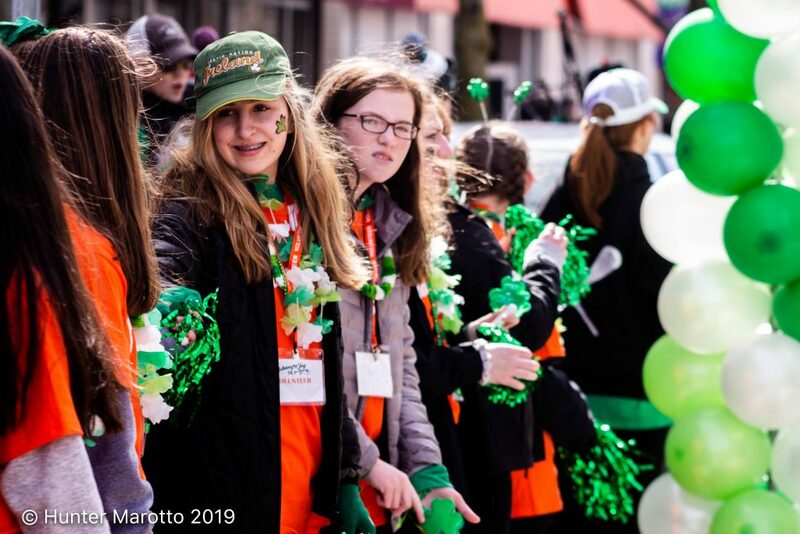 The weather on Sunday morning in West Hartford was sunny and mild, and a record crowd of all ages – most dressed in green – turned out in West Hartford’s Blue Back Square to run, walk, and cheer at the ninth annual St. Patrick’s Day-themed Johnny’s Jog for Charity. 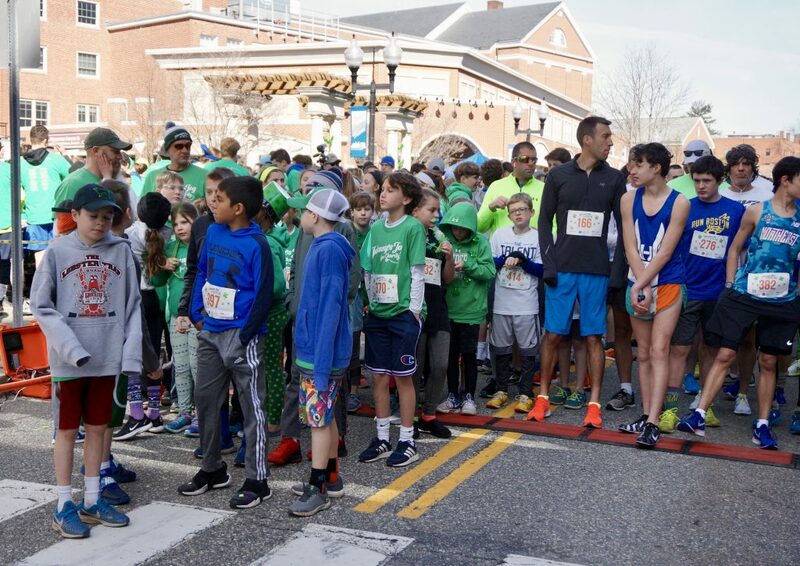 Organizer Laura Moran said that about 800 people had pre-registered for the event, and several hundred more registered on race day. 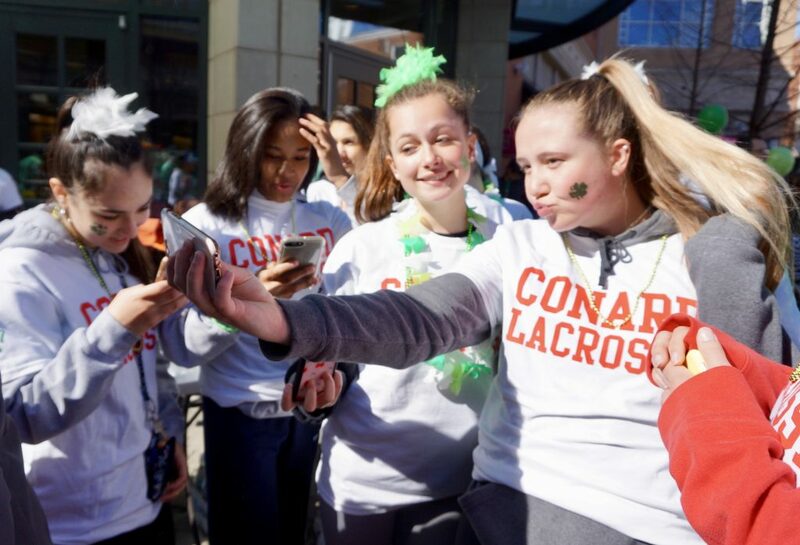 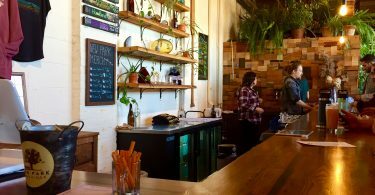 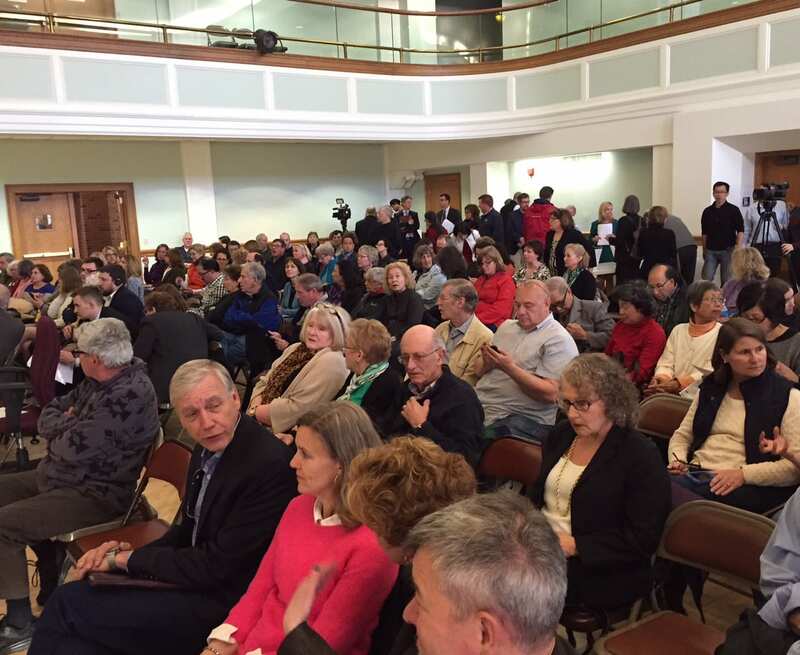 “We had at least 1,000 – it’s just awesome,” Moran said. 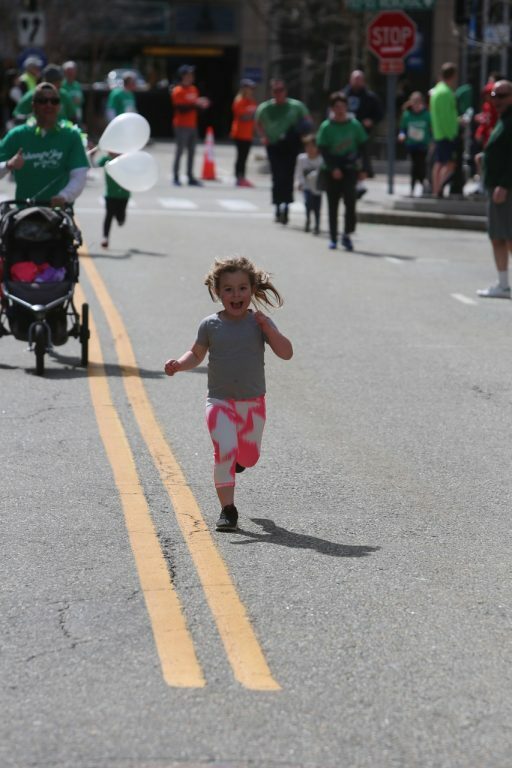 This is the first time since 2012 that the weather has been really nice on race day, she said. 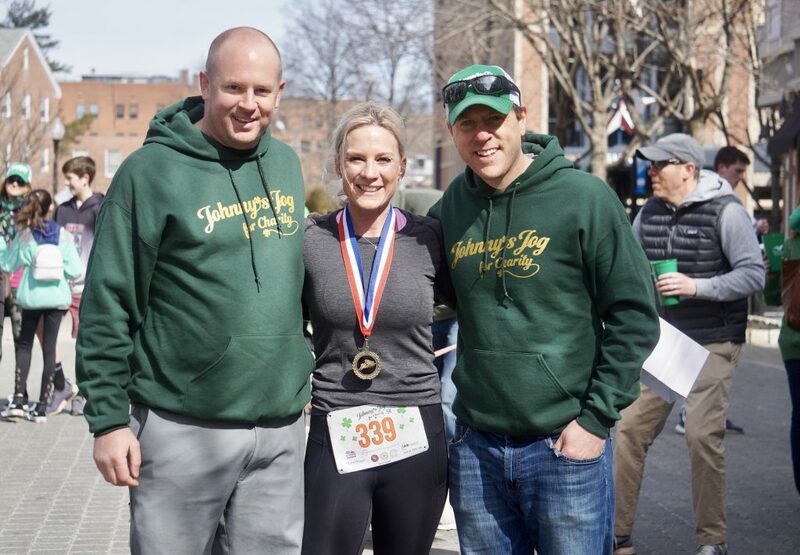 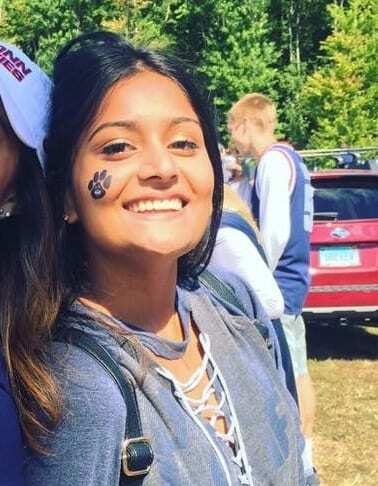 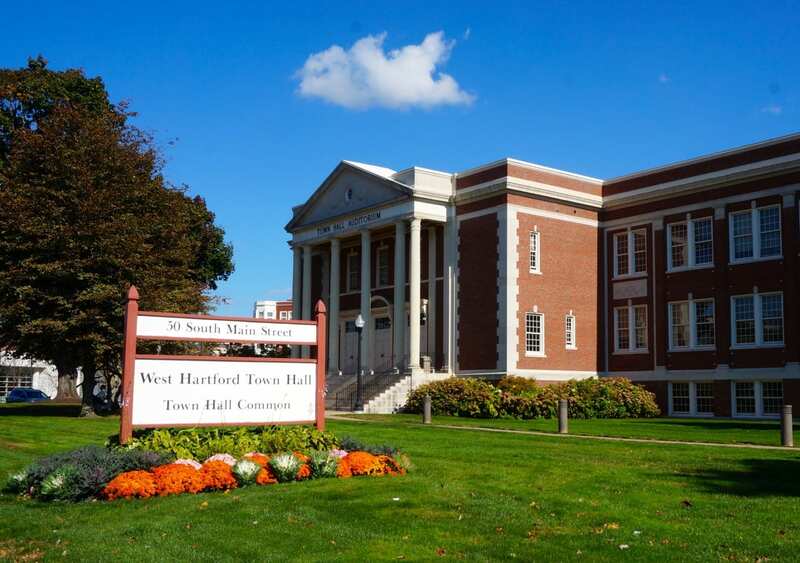 Laura and her husband, Dan Moran, and their friends and fellow West Hartford residents Dan and Kelly Clark, started the 5K fundraising event in 2011. 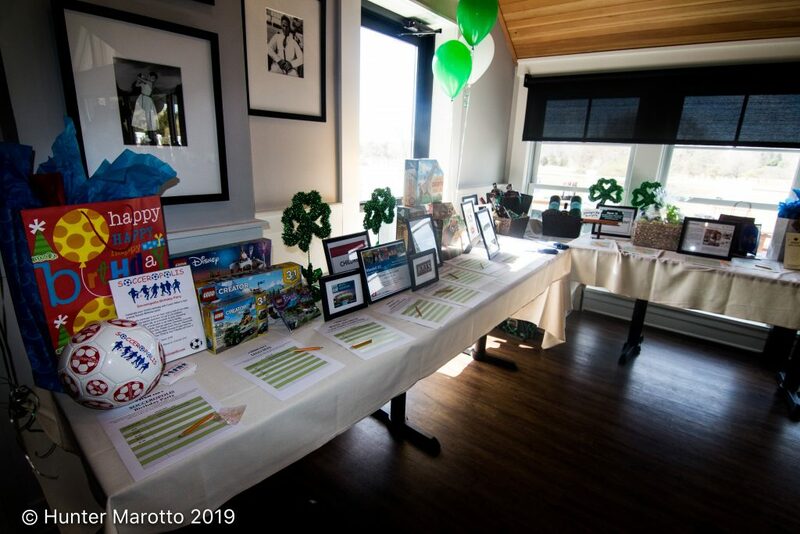 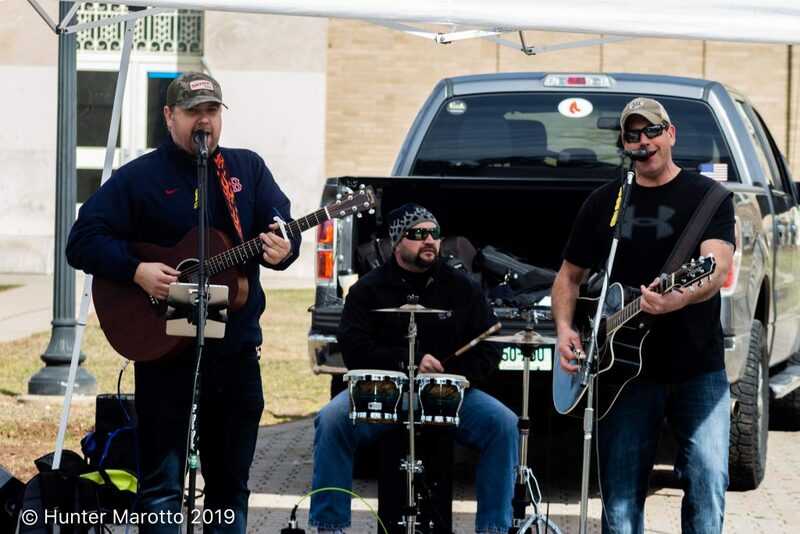 “Sponsorship is up by $20,000,” said Laura Moran, and although the numbers would not be finalized until after a silent raffle and auction, held after the race at Rockledge Grille, she anticipated a total of $80,000-$90,000 would be raised. 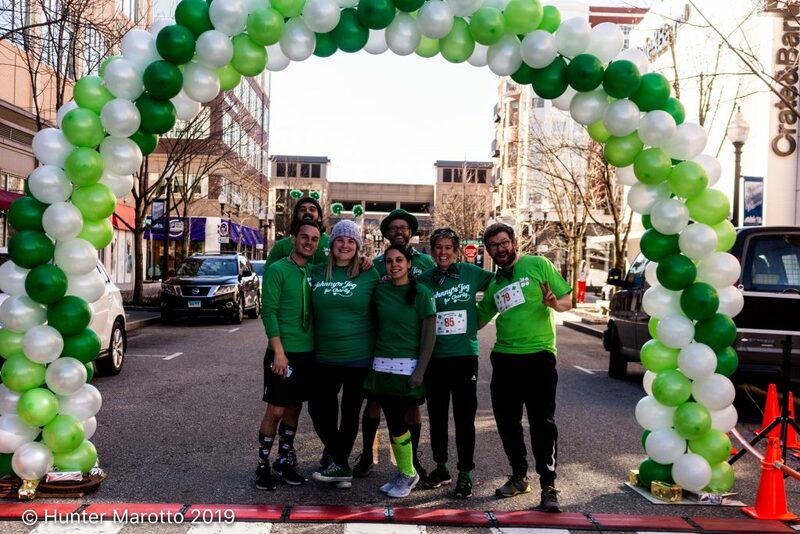 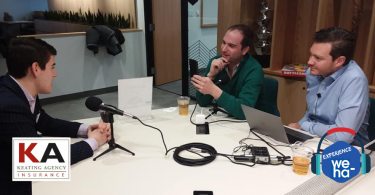 “We’re in awe of how embraced the event is. 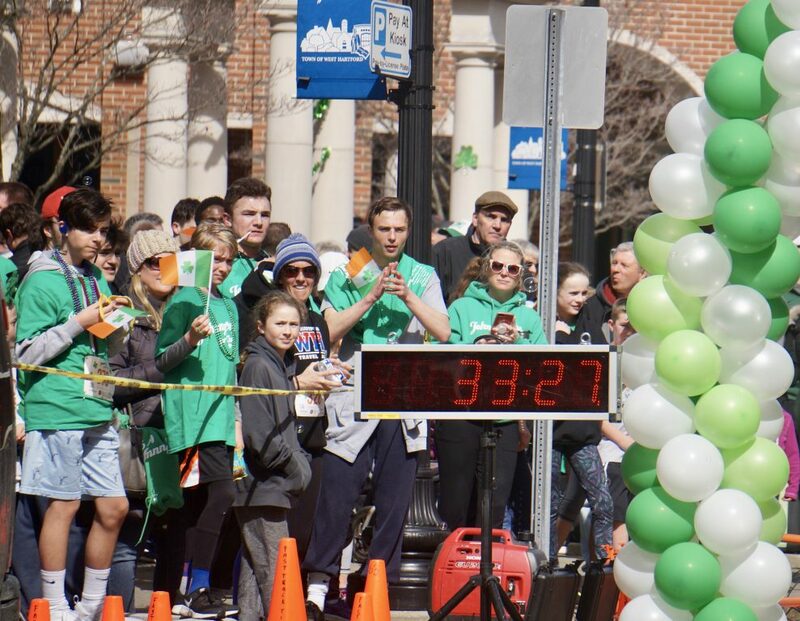 From the littlest kids who hand me dollars and cents, to the big sponsors, and all the volunteers,” Laura Moran said, it’s just incredible. 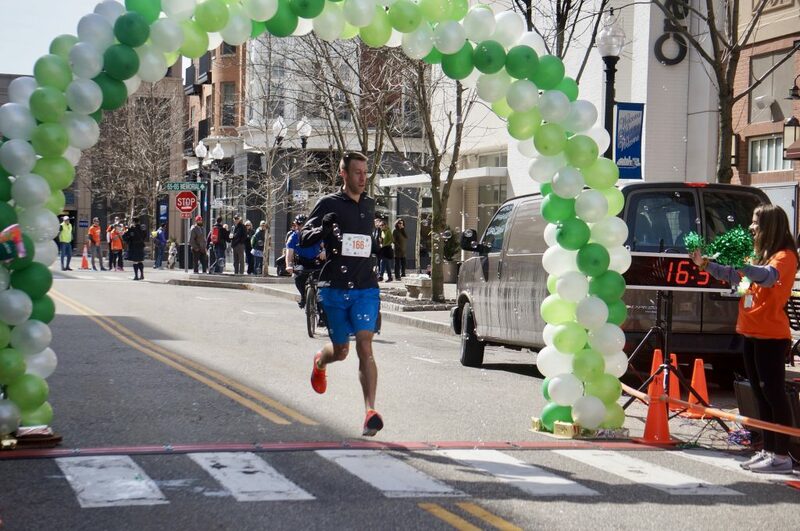 Greg Weaver, 39, of West Hartford was the overall winner again this year, crossing the finish line in 16:34 – a new record for the race. 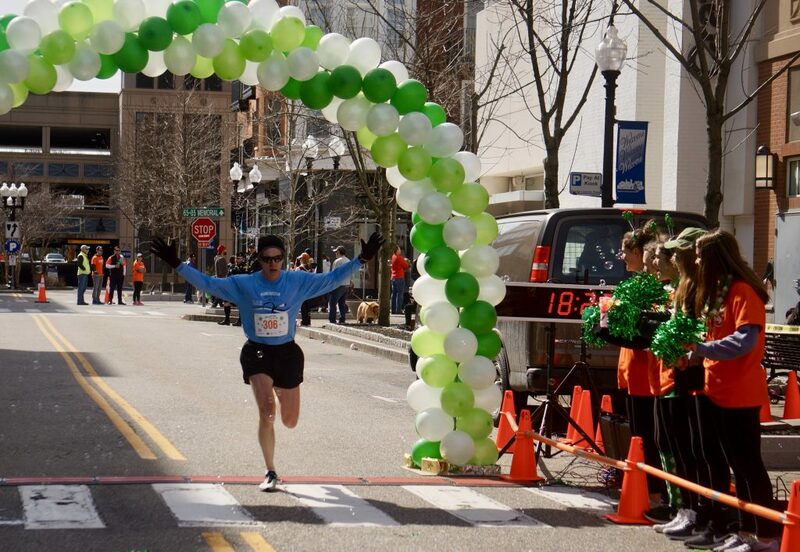 Chessie Lawson, 40, also a West Hartford resident, was the first female finisher in 22:52. 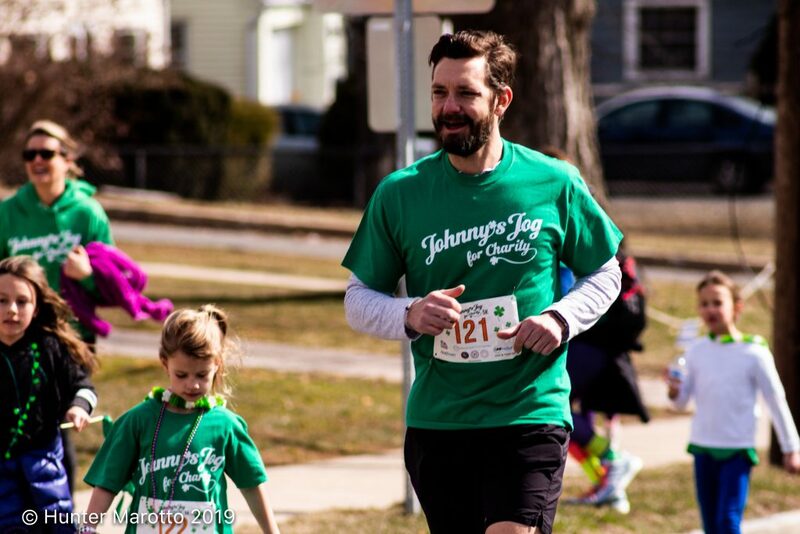 Johnny’s Jog for Charity is much more than a road race. 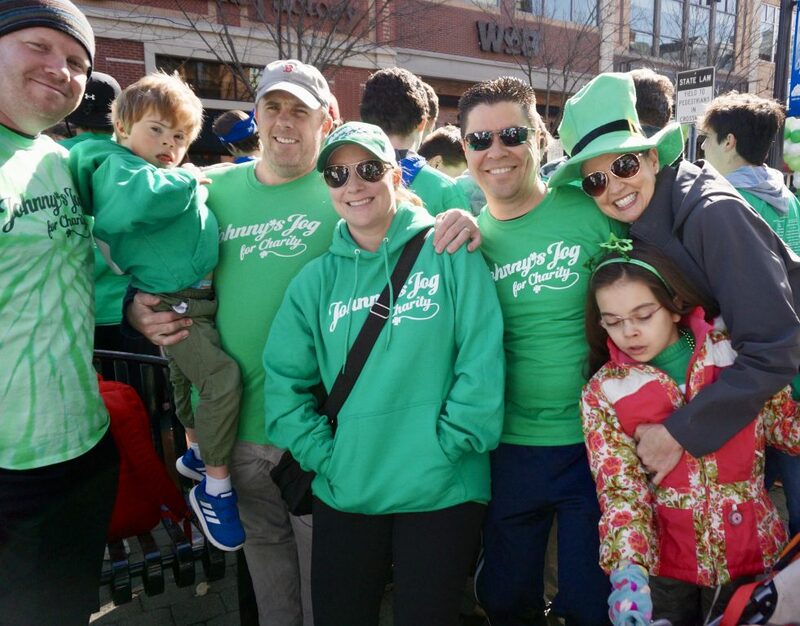 It was inspired by the incredible, brave, but sadly brief life of Laura and Dan Moran’s son, Johnny, who was born in 2007 with Wieacker Wolff Syndrome, a rare and debilitating condition. 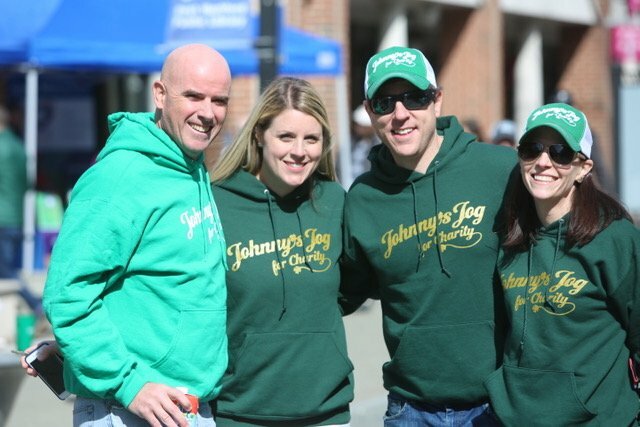 Johnny passed away in April 2016, but the organization and race founded in his honor continue to celebrate his resilience and strength, and bring the community together. 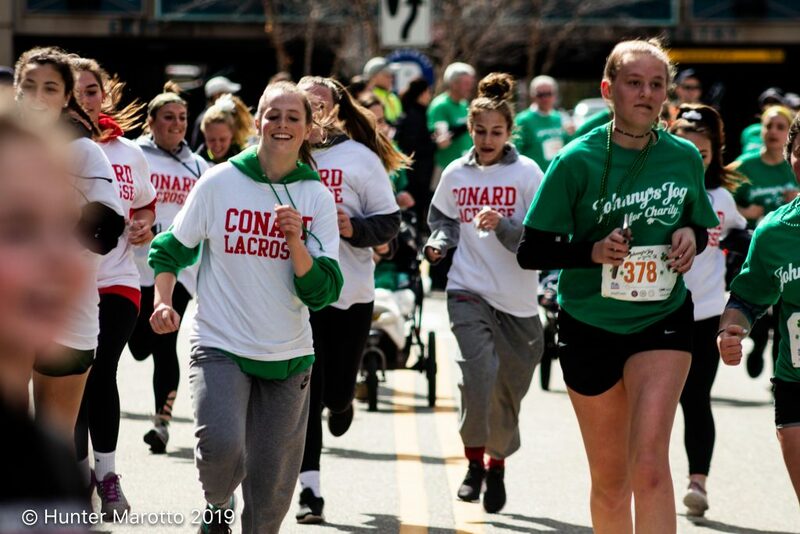 The beneficiaries of the race include Covenant Preparatory School of Hartford, which provides tuition-free middle school to boys in underserved families in the City of Hartford in order to help them graduate academically prepared for further education (www.covenantprep.org); the Miracle League of Connecticut, which fosters a community and sports facilities that remove all barriers so young athletes with unique needs are able to join their friends and experience the joy and triumph of team sports in their purest form (www.miracleleaguect.org); and the Molly Ann Tango Memorial Foundation which helps finance the purchase of much-needed medical supplies or services when insurance is exhausted and other social programs are unavailable (www.mollytango.org). 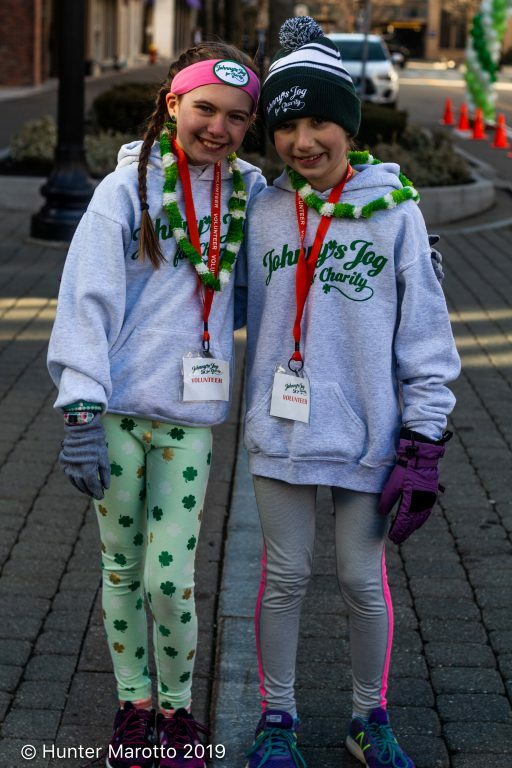 These organizations benefit the lives of countless children annually and depend on communal donations to do so.